What’s our story? Take a look at the history of Grip Power Pads®. Our first product was actually invented by a Doctor of Physical Therapy (DPT). While performing intense workouts, he realized that he needed to protect his hands. After trying a number of different brands of workout gloves, he was still getting blisters and building up calluses. His hands hurt. His gloves were also retaining sweat and they even began to smell. When he tried using thin rubber covers on his palms instead, he couldn’t get a solid grip. This is when he decided to design something that would work. He invented the Original Grip Pad, which was eventually developed into our current product, the Grip Power Pad®. Using the Grip Power Pad®, he no longer gets blisters and calluses. When his hands sweat, the moisture doesn’t accumulate. Instead, it evaporates and dries quickly. The grip he’s able to achieve is unmatched when compared to any other product he’s tried. The kind of rubber that’s used in the Grip Power Pad® adds to the friction when he’s holding weights or hanging onto a pull-up bar. This makes his entire workout more productive. He’s more comfortable throughout his workout, feeling safer and more secure. The strap design never entangles his fingers or put pressure on his wrists. Instead, it allows his hands to breathe while holding the pad securely over his palm, where he needs the grip. He enjoys the high-quality Velcro that’s easily adjusted and quickly removed at the end of his workout. Want to be like him? We thought so! 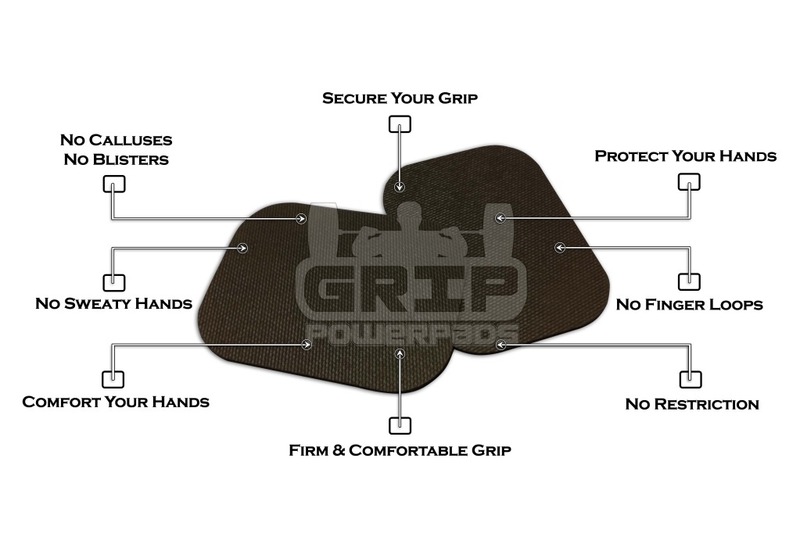 After many design revisions, the Grip Power Pad® is far better than any other workout glove. It’s a necessary piece of gear to give you the grip you need while protecting your hands. Our mission is to make Grip Power Pads® the #1 choice in their class. We don’t want to be the best alternative to traditional gym gloves… We want to replace them altogether! When it comes to fitness trends, Grip Power Pads® are ahead of the curve. U.S. fitness-equipment manufacturers serve two main markets in the $10 billion dollar fitness market: consumers and institutions. Out of the two, the consumer market is significantly larger, as over 80% of fitness equipment is for personal use. Since the 1990s, the industry has grown immensely though the rising popularity of sporting goods stores, mass merchants, and online retailers. In general, fitness-equipment specialty stores usually sell what is considered to be the “top of the line” equipment, while general sporting goods stores and mass merchants sell lower and mid-priced lines. The price of Grip Power Pads® can’t be matched! The average price of workout gloves is around $15, and higher quality gloves often sell for double that amount. We offer a product that is just as durable as higher-end workout gloves and easier to use and store… all for less than $10. Our low cost can sometimes turn off some consumers who might view our product as being “cheap.” But there is nothing cheap about the quality of Grip Power Pads®. Our story began with a mission to provide the best grip on the market. As technology advances and we refine our approach, we continue to provide our customers with the best product on the market, for the best price. Grip Power Pads® are gaining worldwide momentum! We’re proud to offer worldwide shipping on our pads. We offer very competitive shipping rates, which vary depending on your location and the quantity of your order. Any order over 500 pairs will receive free worldwide shipping, along with a personal tracking number. You may call us at +1-877-644-7171 and choose option 5 for international shipping details. We take a variety of payments, such as Google checkout, Amazon checkout, PayPal and Credit Cards. If you have any questions regarding our shipping, you can email us at [email protected]. Grip Power Pads® ships daily worldwide to countries such as: United States, Australia, Austria, Brazil, Canada, England, Finland, France, Germany, Great Britain, Greece, Italy, Japan, Korea, New Zealand, North Korea, Puerto Rico, Spain, Sweden, Netherlands, and United Kingdom. Soft, durable Grip Power Pads® work to maximize comfort and grip with a “no strings attached” design. Our pads adjust to any hand size (for a man or woman), and feature a non-slippery pad surface that makes your gym experience safer. Our unique stretch material protects your palms from calluses and blister formation. The lightweight composition and thickness of the pads make them “just right” to secure your grip. We are proudly made in the USA. Our Soft and Firm Grip Power Pads® are made of natural (100% ) rubber that’s manufactured in the USA. Please visit our Shop Page for more details of our products.